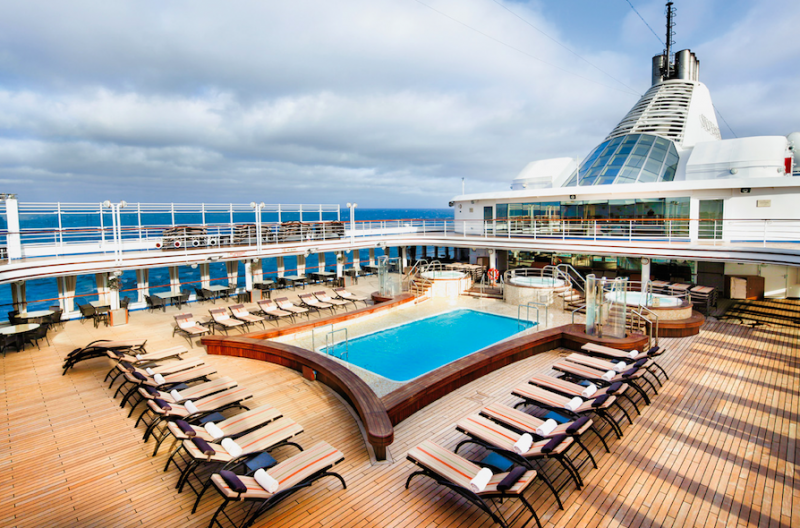 For those seeking an unforgettable Christmas gift for someone special, Silversea, founded in the 1990’s, recipient of the USA’s Global Traveller 2016 Leisure Travel Award for ‘best luxury cruise line’ and a Condé Nast Traveller 2015 award for food in the ‘world’s best small cruise ship’ category, offers a voyage like no other. This Italian, family owned business, features a fleet of eight small ships and provides exceptional standards of service and comfort. Embarking at Piraeus, Athens, along with our bulging suitcases, my mother and I were enchanted with our first view of the sleek lines of the Silver Spirit, which was launched in 2009 and carries 540 passengers, served by a dedicated crew of 376. The simple and efficient check-in procedures ensured that no time was wasted and we were promptly escorted to our luxurious and spacious suite, sumptuously furnished with a plump sofa, two leather tub chairs, soft carpeting and comfortable beds swathed in crisp white linens with soft feather filled pillows. We took a moment to relax on our private veranda, admiring the view across the glittering ocean, and our charming butler arrived. Graciously introducing himself, he poured two glasses of chilled champagne with a flourish, and presented us with a selection of Bvlgari and Salvatore Ferragamo toiletries. He then requested our preferences for keeping the fridge fully stocked with complimentary soft drinks, wines and spirits, and the contents of our fruit basket. The luggage was swiftly delivered, and whilst our butler unpacked, we headed for the deck to watch ‘anchors aweigh’ as we sailed sedately on the sparkling waters of the Aegean, bound for Santorini, Rhodes, Aghios Nikolaos, Katakolon, Argostoli, Corfu, Dubrovnik and Venice. The Silver Spirit offers eight passenger decks, with interiors adorned with an imposing art collection including works by Rembrandt, Chagall and Picasso and several Salvador Dali sculptures. 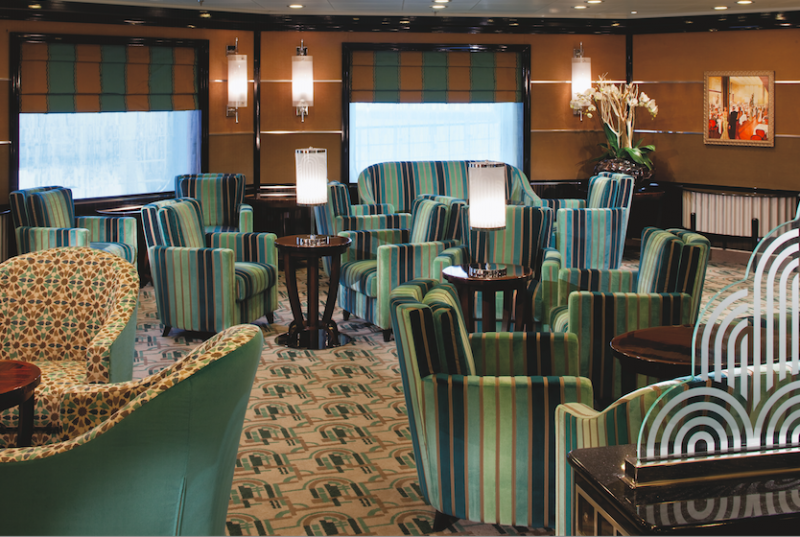 The decor follows modern and art deco themes with a soothing palette of colours and there are several lavishly furnished bars including the Panorama Lounge where Amedeo, an excellent pianist, performs and he entices passengers onto the dance floor with ease. 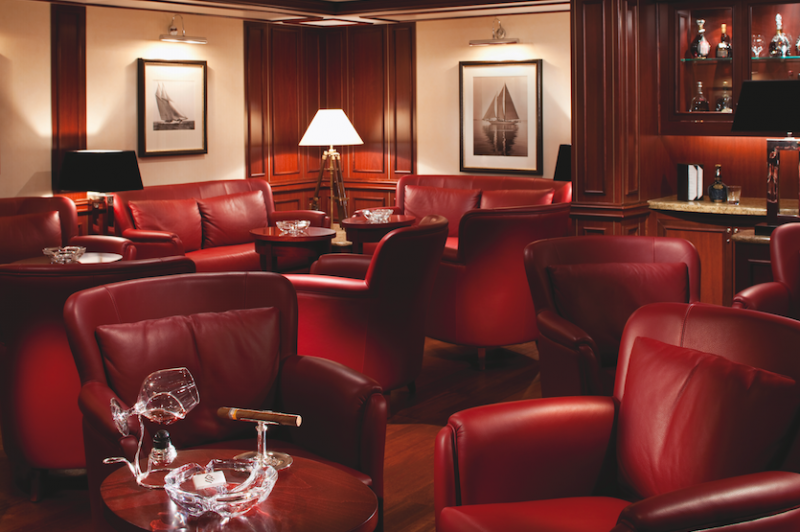 Other socialising spots include the Connoisseur’s Corner, a clubby cigar and cognac lounge where guests are welcome to relax in low-slung leather chairs and enjoy their preferred cigar, fine cognacs, vintage wines, ports, and a selection of the world’s finest caviar including Royal Oscietra. 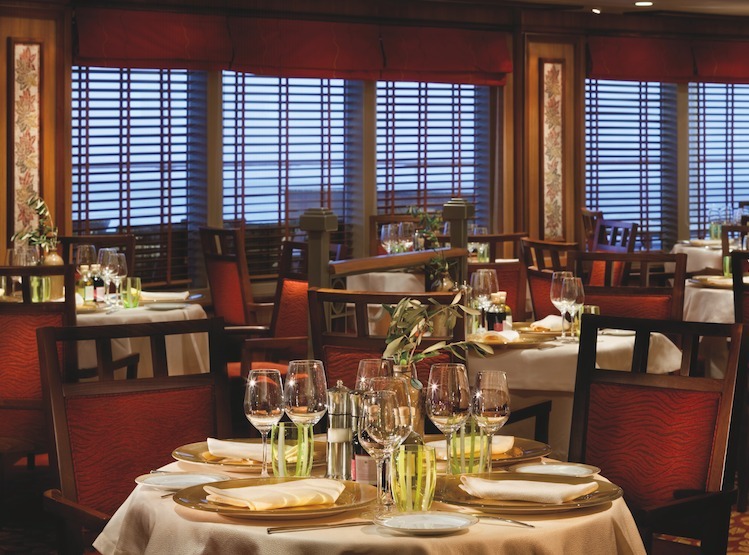 There is no shortage of on board dining venues and we took advantage of the open seating option offered by the ship’s main dining room, The Restaurant, which serves modern Mediterranean and regional dishes. I sampled the mouth-watering broiled lobster tail with drawn butter, vegetable vermicelli, parsley potatoes and lobster coulis, and served with a glass of Vincent Girardin Corton-Charlemagne 2011, it was perfect. Up with the larks the following morning and our ship had docked in Santorini, which was a dazzling sight from our veranda. 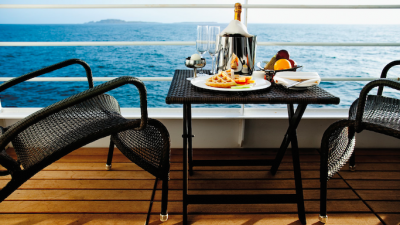 After a delicious in-suite breakfast, served by our butler with much aplomb, we hurried off the ship to explore our first port of call. Back on board in time for luncheon we dined in La Terrazza, which offers a buffet style extravaganza. Temptations included a choice of meat or fish, pasta or pizza, a salad bar and indulgent desserts that just cannot be ignored. We dined ‘al fresco’ on the back deck, cool in the shade of the overhead canopy, and then an afternoon snooze in the sunshine was just the ticket. For water babes, the pool deck features an impressive swimming pool with three bubbling Jacuzzis surrounded by ultra comfortable sun loungers and the pool bar and grill serves light fare for luncheon, which means that those of us who prefer not to be disturbed during our sun bathing sessions may dine ‘in situ’. After a pre dinner tipple on our veranda we made our way to The Bar, where Captain Mino Pontillo’s Welcome Reception was in full swing. Tasty canapés, hors d’oeuvres and cocktails were served by a bevy of dapper waiters and our fellow passengers were simply dazzling in their elegant formal wear. Ladies, dressed in stylish, flowing evening gowns and gentlemen resplendent in their evening attire. Later we dined in the Stars Supper Club; a retro experience, which recalls the romance and opulence of Manhattan’s legendary Rainbow Room. Delectable small plate selections are served on food sensitive dishes whilst guests are entertained by the ‘live’ jazz band and a cabaret vocalist. And in the likely event that diners are overwhelmed with the desire to display their nifty footwork on the dance floor mid-course, the food remains at the right temperature. 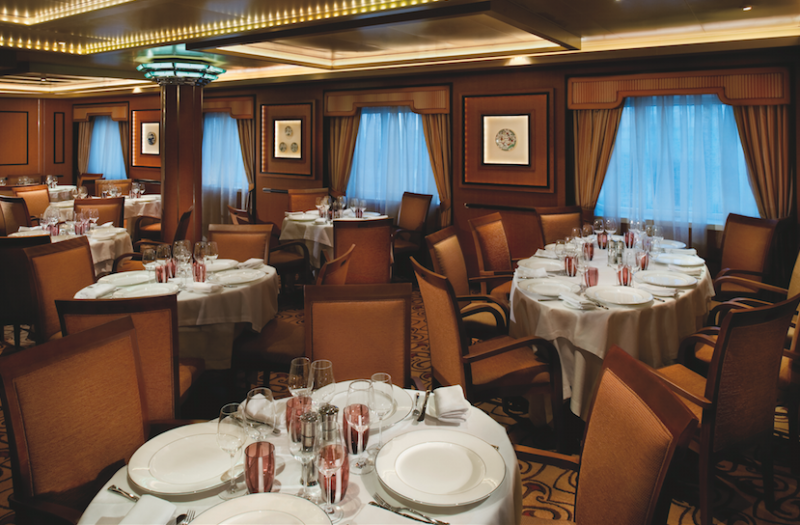 Other dining options include Le Champagne, the only Relais & Châteaux restaurant at sea, which features a small walk-in wine room. 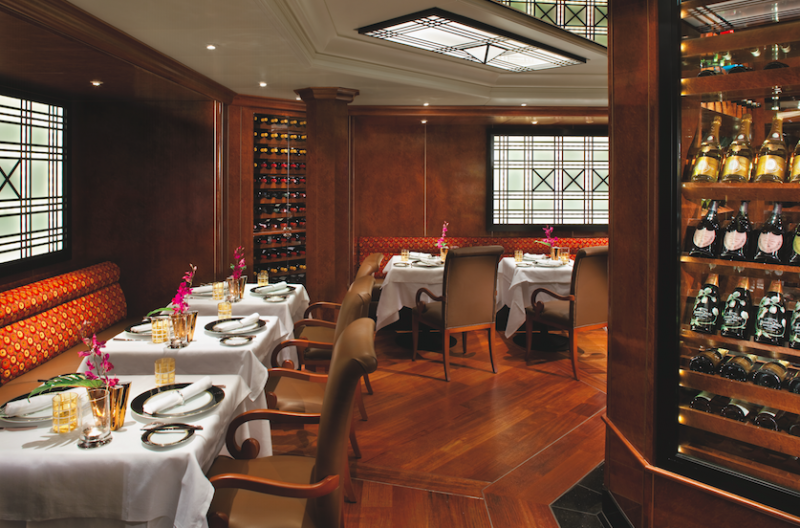 For fans of Asian fusion cuisine, Seishin, offers sampler menus or a nine course degustation and by night, La Terrazza, presents a wide range of authentic Italian dishes. For those seeking the utmost privacy, there is the option of in-suite dining, selecting dishes, course by course, from The Restaurant menu, or from the room service menu, available around the clock. Entertainment choices include the Show Lounge, which presented a striking performance by four soloists and a pianist from Milan’s Accademia Teatro alla Scala. The audience was treated to a selection of enigmatic, evocative and beautiful librettos from the world’s most magical operas and the soaring voices of the soprano, mezzo soprano, tenor and baritone were magnificent. Another highlight of the cruise was a performance by Moss Hills, the talented cruise director. A first rate entertainer and a master drummer, guitarist, saxophonist, keyboard player and singer, he soon had the audience singing along to his repertoire and some took to their feet in the aisles with fervour. For those keen on activities, a daily programme is delivered to each stateroom with details of events held during the day and included a stretch class, Pilates, Yoga, table tennis, shuffleboard, golf putting and a number of enrichment lectures, seminars and cooking demonstrations. And for those of us with a passion for doing as little as possible, the Spa is the place to be. 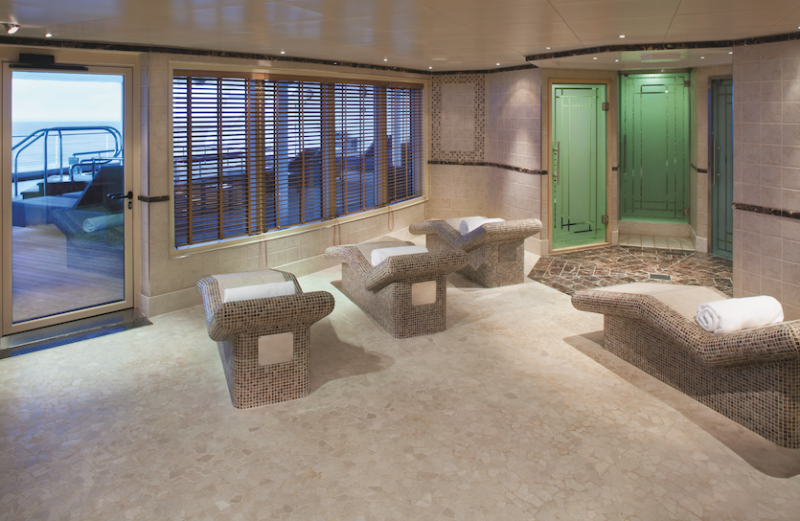 Covering 8,300 sq ft, there are nine treatment rooms, interior and exterior relaxation areas, and an outdoor whirlpool. ‘twenty years from now, you will be more disappointed by the things you didn’t do than those you did. So throw off the bowlines. Sail away from safe habour. Catch the wind in your sails. Explore. Dream. Discover’. 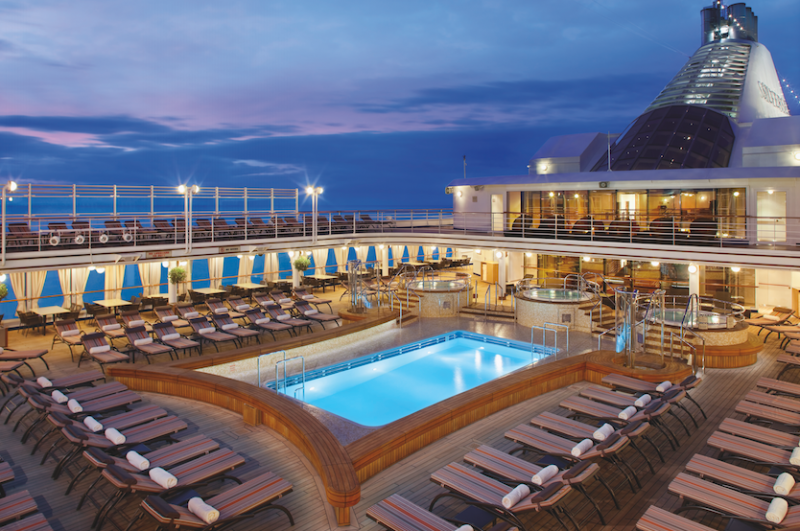 For brochures and quotations visit www.silversea.com or call 0844 251 0837. 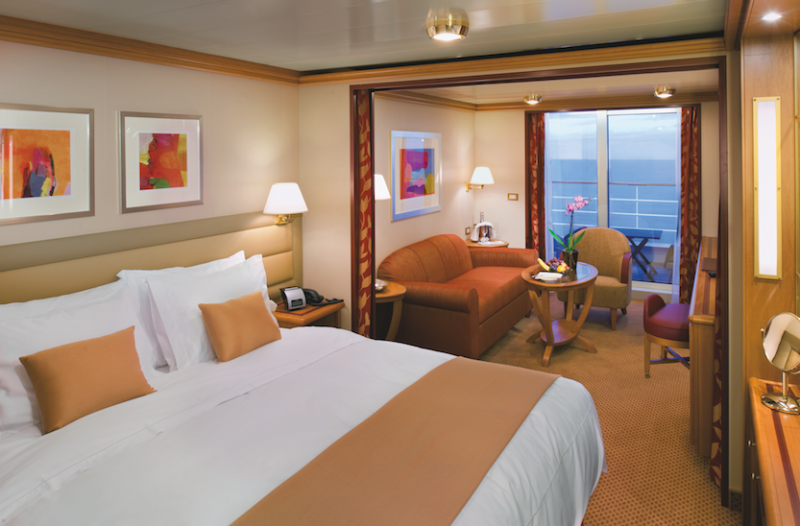 Rates include complimentary shore excursions, on board WIFI, beverages in-suite and throughout the ship (including select wines, premium spirits, speciality coffees and soft drinks). Transportation from the ship into the towns of most ports of call is complimentary and gratuities are also included.